You’ve spent the winter preparing your boat so that it performs optimally when the season begins, your fitness is about to peak following your unforgiving training regime during the off season, and you have studiously refreshed yourself on the minutiae contained within the sailing regulations. So what else is there left for you to do before the new sailing season starts? Well, why not familiarise yourself with the common birds that you may see while you are on the water? 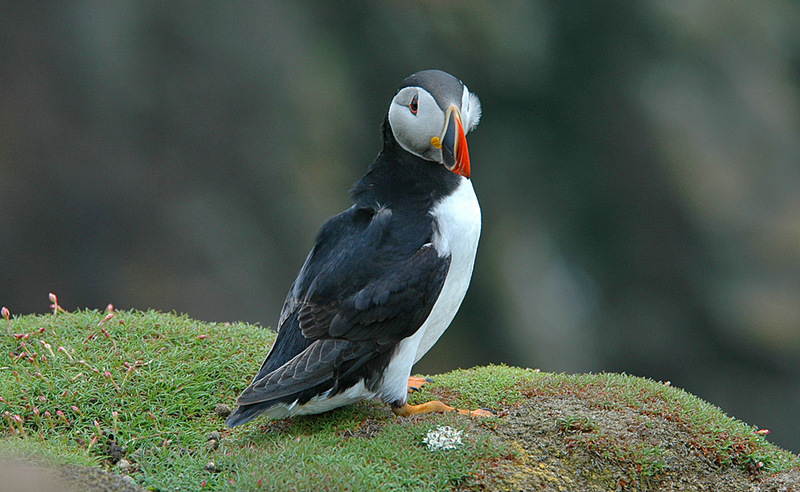 Within the sailing area bordered by Balbriggan to the north, Rockabill lighthouse to the east and Lambay to the south, we are fortunate to have the opportunity to see up to 40 + different species of birds during a typical six month sailing season. These species include those that we see while launching, to those we see while at sea and rounding the islands. Some of the birds you see are locally common, while others are nationally very rare. Sightings can range in numbers from individual birds to movements of up to ca.2000-3000 birds per hour in the optimum weather conditions (easterly winds) and at the right time of the year (autumn). Within these borders there are significant breeding populations of terns and auks, which must not be disturbed in order to get better views. The birds’ welfare must at all times be given priority. A posting such as this is limited in what it can contribute to bird identification and must of necessity limit itself to the more common species that can be seen. Additionally, with the enormous variances in bird plumages, in particular the gull species, the most common adult summer plumage can only be referenced. Should any reader wish to get more information on any particular species, there are numerous internet resources/field guides available. Most of us will have a bird that we are familiar with, and this is very useful when trying to identify unfamiliar birds. This is our baseline species and from which we can tell what species a bird ‘is not’. 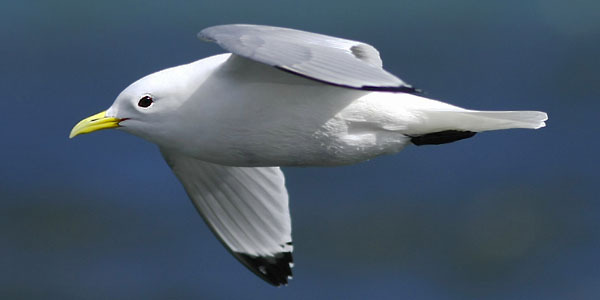 However, similar looking species of birds can cause confusion and seabirds can look very ‘samey’. The birds we see while on the water broadly fall into three colour patterns, overall dark looking, black and white, and grey and white, and this can lead to misidentification. Fortunately, there are a number of identification features that can distinguish the different species. Familiarity with these features can help in eliminating a common species and aid in identifying a less common species. 5) flight (is it stiff winged, does it dive, does it shear over the water etc). 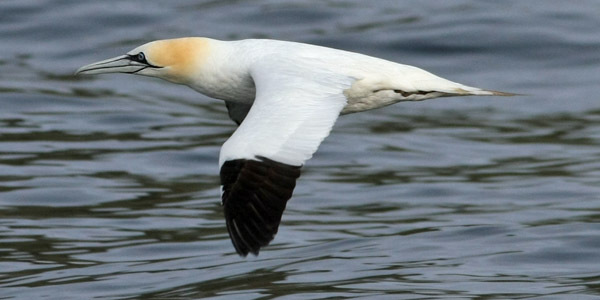 Identification: The largest European sea bird. Unmistakable in its dazzling black and white plumage. Birds flying out at sea look shining white. Cigar-shaped body and very long wings identify birds in flight. Almost always in the air. Dives from up to 30 metres with half-folded wings. When seen well, flexing of wings at tips is noticeable. Most birds disperse to southern oceans in the winter. Identification: A large, ungainly, dark looking bird bird. Summer plumaged birds are bronze above, steel blue below, with a white thigh patch. 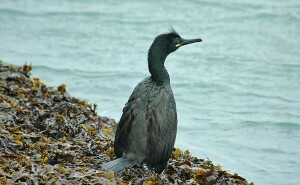 Adult birds are distinguished from the very similar looking Shag at all times of the year by their larger size, and by white on the face. When seen flying, kinked neck and rather stiff flight profile create a ‘prehistoric’ look. Present all year round. Identification: Large, black looking bird. Summer plumaged birds have bottle green plumage with a head crest that is often raised. Prefers more open water than Cormorants. Markedly smaller, slimmer-necked and more slender billed than Cormorants. 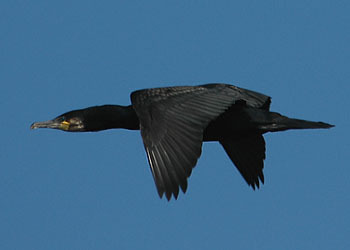 When seen diving from the surface of the water, dives with a more noticeable ‘jump’ than a Cormorant. Like Cormorants, when on rocks, extend their wings to dry them, but stretches its wings out further. Present all year round. Identification: In summer plumage and when seen well, the most identifiable member of the Auk family to occur. Its small shape, multi-coloured bill and face pattern, along with its dumpy black and white body make its appearance unique. The bill changes shape and colour during the winter. Flight is fast for a heavy bird and usually low over waves. Birds sit high in the water and dive well. Winters far out to sea. Identification: Commonest of our Auks. Distinguished from Razorbill (when seen well) by larger size and slender, dagger shaped bill. Difficult to separate from a distance. Flight is fast and low with rapid whirring wingbeats. Head and upperparts brownish with white underparts. Present all year round. Identification: Smaller than a Guillemot, the white on the wings make summer plumaged birds unmistakable. Bill pointed and black. Head rather small, body plump and pot-bellied. When seen well, red feet and legs are visible. Have quick, whirring wingbeats and fly close above the water. Present all year round. 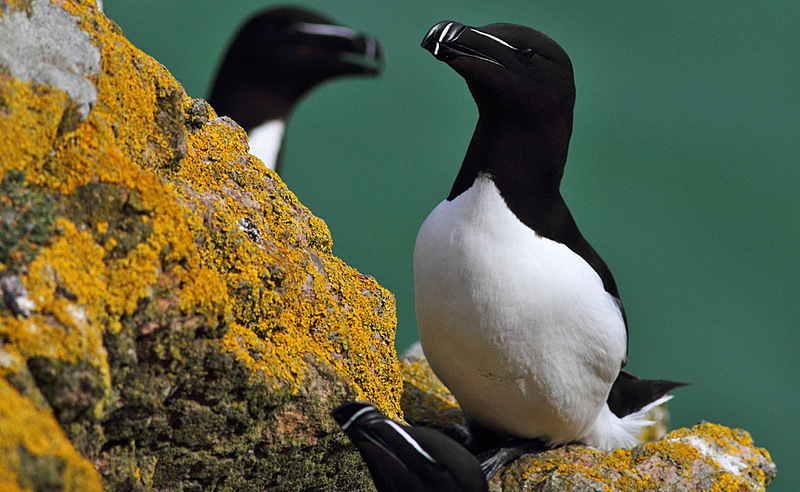 Identification: Short, deep bill, heavy head and thick neck, together with its jet black and white plumage identify the Razorbill. Marginally smaller than a Guillemot. 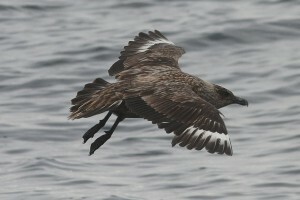 Sits high in the water and dives showing wing and tail tips as it goes under. Nests with Guillemots on cliffs and stacks. Present all year round.. 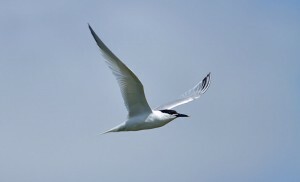 Identification: Largest of the Irish breeding terns. Very long, slim wings, short forked tail and stout body. Birds arrive for the summer with all black crowns, but acquire a white forehead by the time the chicks hatch. Thin, long, yellow-tipped bill. Flat looking head profile. Adult has black, shaggy head crest. Legs always black. Noticeably whiter looking than Common and Artic terns. Hovers and plunges to catch fish. Outer wing feathers look dark. When flying, bill usually pointing down. Present March to September. Identification: Hovers and plunges to catch fish. Very similar to Arctic Tern. Slightly larger, with different structure when in flight. Black-tipped orange-red bill, slightly broader wings and long red legs distinguishes from Arctic Tern. Outer wing feathers dark. Present May to September. Identification: Very similar to Common Tern. Has blood-red bill, short red legs and tends to be greyer below than Common Tern. Wings can look transparent. Often dives with a ‘stepped hover’, dropping short distances and hovering again. Present May to September. 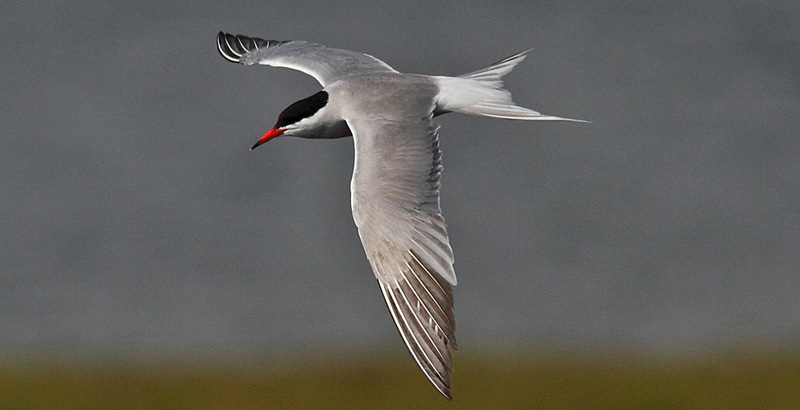 Identification: Have shorter, broader wings, and faster, shallower wingbeats compared with Common or Arctic Terns. Hovers less than other terns, and has a distinctive angled power dive as if ‘flying into water’ to catch fish. A pink flush sometimes visible on the body. Very pale looking below compared to Common and Arctic Terns. Black bill has a red base, but looks all black. Legs long and bright red. Present May to September. 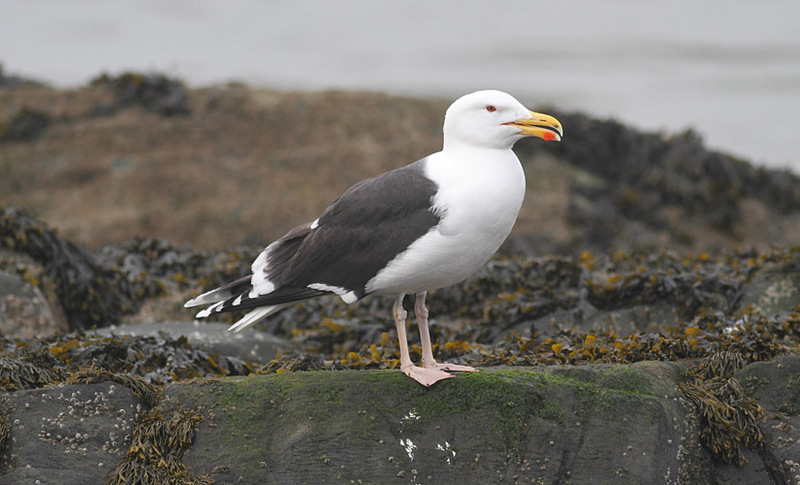 Identification: The most marine of our common gulls. Have long, straight narrow wings with triangular black tips and thin white edge at rear. Bill yellow, and legs short and black. Birds pick food from the surface in flight. May plunge from a height like a tern. Winter far out to sea. Present all year round. Identification: Smallest of the common seen gulls. Head appears black, but with good views can be seen that it is actually dark brown. Slender build with pointed wings. 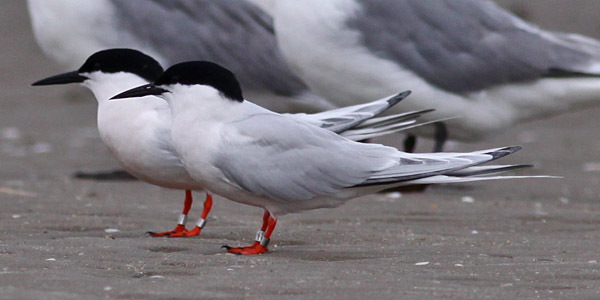 Combination of red or orange legs and red bill are seen on no other gull (but be aware of terns!). Distinctive black, white and grey pattern on wings. Flight is much lighter and more effortless than larger gulls. Present all year round. 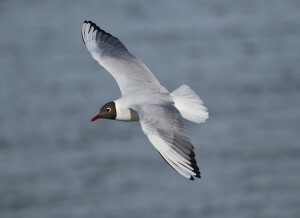 Identification: The typical seaside gull, widespread and common. 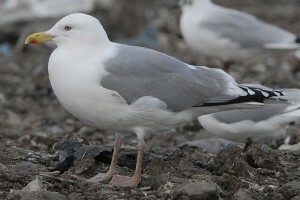 Heavy build and large bill distinguishes it from other gull species with grey backs and black wing tips. Legs pink and bill yellow, with red-orange spot. In July-November, many birds show brown wing tips with no white spots. Present all year round. Identification: Largest of all gulls. Broad wings, jutting head and huge bill create very aggressive appearance. Have dark back and wings with white margin at front and rear of wing. Flight looks slow and ponderous. Bill yellow with red-orange spot. Legs pink/flesh coloured. Present all year round. Identification: Black and white bird. Long, narrow wings are set midway between bill tip and tail, creating black or white ‘cross’ appearance. Can be seen flying singly or in small parties. 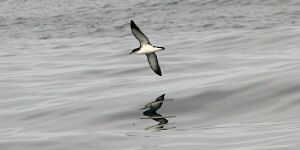 In the right weather conditions in autumn, can be numerous on passage. Flight distinctive. A few stiff-winged flaps alternate with a period of gliding. Birds bank steeply to show black above and white below. In rough weather birds seek shelter in wave troughs. Present May-September. Thanks to Paul Kelly of www.irishbirdimages.com for permission to use the photographs contained in this post.